Thanks to both groups for the informative presentations in class today. Now that we all know a little bit more about where each part of the project stands, we need to make some rapid decisions about what we want our final product to look like by the end of classes. What is our objective in the final product? To defend a historical thesis about runaway slave ads? To demonstrate how particular digital methods work? To show how an argument that might ordinarily be made in narrative form can also be made through different kinds of visualization? Some of each? Relatedly, who is our audience? Are we interested in talking primarily to other groups interested in digital methods? Or primarily other historians of runaway slave ads? Ideally, we are talking to both, but as with the objective above, we can focus our efforts (and answer the next question) if we have a primary audience in mind. How should the final product be structured? Originally we planned to have each group write an essay, which would be paired with a third standalone "close reading" essay. But it sounds like both groups today thought it made more sense to incorporate insights from the close reading directly into the discussion of digital findings. That could mean just doing one essay per group. Or we could think of a different structure altogether: perhaps something more like a showcase where we display several visualizations (think of this page as an example) that then have a brief description of the argument or significance of the visualization when they are clicked. Another model might be Miriam Posner’s How Did They Make That? post, where we include a brief discussion along with each visualization of how it was made. I would like you to leave your own thoughts related to these questions in the comments, ideally by Friday morning so that we can have a sense of people’s ideas by class time. Coming to some final conclusions about these questions can structure our plan for the final week and also give us benchmarks against which to measure our final product for the final paper described on the syllabus. In the meantime, it sounds like no matter what we decide about how to present the final product, both groups had next steps they were going to work on that you can proceed with between now and our next meeting. And don’t forget to comment below! This entry was posted in Announcements, Group Projects, Meta. Bookmark the permalink. What is our objective in the final project? Personally, I lean toward the idea of demonstrating history through digital methods. Although our findings have been incredibly interesting, I do not think we have time to develop them enough (through detailed research of laws or events that might impact trends) or to clean up the data to achieve a polished result. The size of the datasets is an additional issue we have discussed, especially in relationship to the inequality of Texas’s corpus. However, I think it is extremely necessary to use our historical thesis on runaway ads in order to demonstrate the digital methods, so in that sense, it would still be central to the project. The application to a specific case study would provide our audience with an idea of how these digital methods function in history. Which brings me to the next point: who is our audience? Given the objective stated above, two groups stand out as possibilities. Historians could potentially be interested in our methods, as stated before in class. In addition, however, I feel that this project appeals to the public as a whole, in that technology and its uses in the digital humanities are extremely relevant for today. The project would introduce the public to the process of history (always fascinating!) but I do feel like the logistics of creating an audience out of the general public would require additional effort in the realm of advertising, etc. Perhaps the latter audience, then, is not practical given our current time frame. We could, however, prepare a conclusions page geared toward the general public, with the methods page going into the more nitty gritty details for those interested in possibly pursuing our methods. Structure of the final project! I foresee difficulties in combining results from the two groups. Given that the project is focused on the digital elements, perhaps it would be best to have splash pages for each digital tool used, with examples, explanations, limitations, and application of the close reading to the specific argument put forward by the digital tool. This structure would really emphasize the digital aspect of our project. I came to post my opinions about what we talked about in class on Wednesday, and I saw that Clare has said most of what I was planning on saying, especially in regards to the first question. Even though both groups having been working hard on our projects, I do not believe that we have enough time to really defend our findings. For example, the work Clare has started with Palladio has led to some interesting finds, but we probably do not have enough time to manually collect more ads and input data, which could enhance or even change our argument. However, we can show that Palladio has the ability to visually make a strong argument that some slaves in Texas were running south, possibly to Mexico. The work we have done shows what these tools are capable of and could possibly lead to future research. With that said, I also think our audience should be geared towards people interested in digital history and digital humanities. This could include both scholars and the general public. Navigating these two audiences may prove difficult, as Clare said above. I agree with the idea of having a conclusion geared towards the general public and having more technical writing in the methods section. For the structure of the final project, I think it might be best to separate the two groups, since many of the questions we are looking at differ from one another. I would like to incorporate each close reading essay with the findings, because those essays have really shaped how we approached the digital research and is therefore important to present to our audience. I would also like to have a section where we talk about what future research using a particular tool could look like with our questions. As I said before, I do not believe that we have enough time to fully defend our findings, and it would be nice to explain to the audience what else we would have liked to do and perhaps pose more questions that future research could answer. I think our objective in the final product should be to showcase the digital methods we used, and demonstrate how they help us make arguments that we would otherwise not be able to (or at the minimum, would require many more resources). The methods have been the focus of the class so far. It is true that we have been able to make some conclusions about runaway slave advertisements using the tools and our readings on runaway slaves, but, in at least my group, we have not spent the time that would be necessary to make and corroborate our conclusions. We have results, sure, but they are hampered by small sample sizes and “dirty” data (locations). The class hasn’t led to a pinnacle of the results we have concluded, it has been a climbing hill of increasing mastery of digital tools, preliminary findings, and knowledge of runaway slave advertisements. That said, it is still important we detail our findings and explain the issues that make them a proof-of-concept of the tools in order to demonstrate the utility of what we have done. On a similar note, our audience should be historians who are interested in digital tools. They will be able to understand our purpose and appreciate and even learn from our methods. 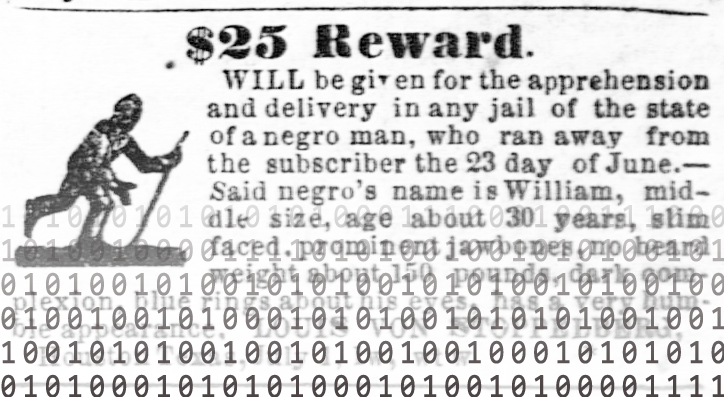 Historians of runaway slave ads will be able to read and enjoy our project and even if they are not interested in digital tools, analyze our findings. In my opinion, the final project should interleave historical background with the methods. In a separate section, we could describe our findings and constraints on them, to emphasize them, but without making them the focus. A showcase wouldn’t be bad, but with only a few main methods (and other methods we considered and dabbled in along the way), would feel incomplete. How Did They Make That? shouldn’t be our focus either, since we want to explain the methods in the context of the questions we are trying to answer.